The Best Beer Pong Table EVER!! What Table Will You Play With? Looking for the best beer pong table or accessories for gift ideas that’ll become the life of the party? Beer pong tables have certainly evolved since I was in college, that’s for sure! We used to stretch pieces of plywood together over 5 gallons buckets before getting hammered, haha. Hey everybody, is there a special someone in your life that you just want to wow with a certain beer pong related gift? I hope there is, because today I have some spectacular ideas for you! These gifts will be for just about anyone. Anyone who loves to have an amazing time that is! Insert smiley face emoji here. Alright everybody, the first gift I am bringing you today is mostly for dads and grads, but no worries I know a lot of girls will love this one too, even you MOM! 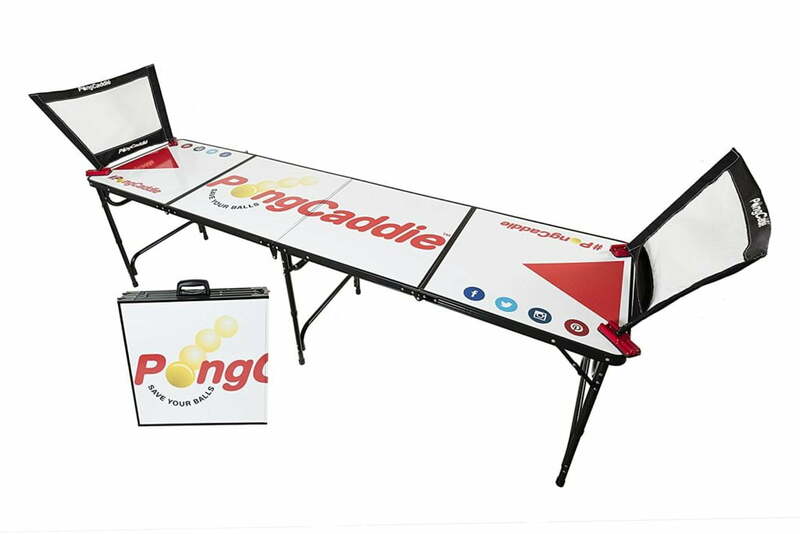 Drum roll please… Here is the PongCaddie Beer Pong table. Remember those days back in college when you would play beer pong and every time someone missed a shot the ball literally went bouncing everywhere? Guess what, times have changed because this kickass table comes with revolutionary technology that will catch the balls for you so that you can chillax and keep playing at your best without getting in some extra cardio. ✅ EASY STOW-AND-GO. Folds up into a 2ft x 2ft case with handles. At 23lbs, it’s easy to transport to and from tailgates, parties or other events. ✅ NO MORE DIRTY PONG BALLS. The nets will catch missed-shots and balls bounced off the cups and slide them nicely into a pocket. ✅ QUICKER GAME-PLAY. Stop wasting time chasing the pong ball around a busy party. Let the Nets keep the party rolling! ✅ GAME CHANGER. Revolutionize the way you play Beer Pong and Beirut. If you need to bring this treasure over to a friend’s place for an evening of fun it even folds up into a two by two case for easy transport and it only weighs in at twenty three pounds. Another amazing thing about the caddy is that it helps keep those ping pong balls clean. I can remember several moons ago when I would play and we would go through a pack or two of ping pong balls easy because after one would hit the floor none of us wanted to use it afterwards. You don’t know what kind of dirt and grime lies lurking on the floor. This is such a great way to have fun and stay sanitary. Way to go PongCaddie! You can pick one of these amazing tables up on Amazon right now anywhere between fifty dollars and one hundred and fifty dollars. I say it is well worth the money, and you will want to use it over and over. 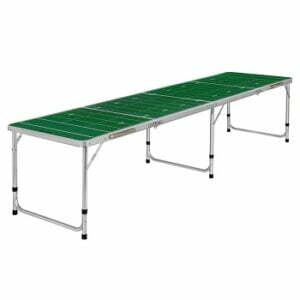 This compact table is not just for parties either, but when you want to host a tailgate at the big game, bring it along and I guarantee you will be the center of attention! I also checked out some of the reviews regarding this beer pong table and on Amazon it actually has five stars! I will give you an idea of what people are saying who have bought this. One reviewer wrote, “It speeds up the game of Beer Pong by at least 90% and its awesome for keeping the balls clean”! Ninety percent? That is a hell of an increase if you ask me, and you should because I am definitely an expert at this game. Another person wrote, “The net works great and it’s super easy to setup”. Ladies and gentlemen I think we have a damn good gift on our hands that is fun for everyone. By everyone I mean everyone over the age of twenty one of course! We have another sweet portable beer pong table here, but I don’t think it can match the PongCaddie. 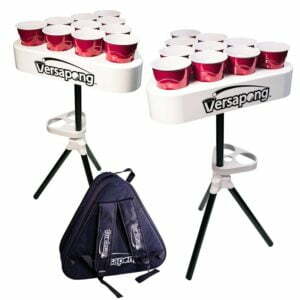 This one is called the Versapong Portable Beer Pong Table. It doesn’t have any cool accessories like the nets for catching balls that the PongCaddie has, but it does have two cupholders for your beers on the bottom portion of both tables. Also, you have to be careful about missing because this one isn’t really an actual table at all. This product is actually two different cup holders that hold ten cups of beer, so you won’t be bouncing the balls, you will be throwing them instead. That is kind of strange, right? This thing also comes with its own backpack carrying case, and a hell of a price tag if you ask me. If you decide to buy this you are going to be out almost a thousand dollars, yikes! The Versapong Portable Beer Pong Table scored 4.8 stars on amazon and is selling for almost $200 bucks. Two hundred dollars for a portable beer pong kit without an actual table? Up to you guys, but I think I would pass on this one honestly. Cool idea, bad price for what you get. Moving on, while we are on the subject of beer pong, how about we throw in some other cool gift ideas to accessorize your new table? By accessorize, I mean light up the room with your cups! 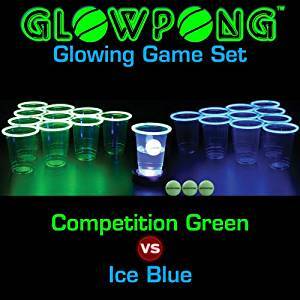 GlowPong is offering to give you twenty for light up party cups for a sick price of under $50 bucks, and you don’t need to have a black light in order for the effect to work! These things will definitely set an ambiance and they look amazing! There are twelve blue light up cups and twelve green light up cups that allow for some amazing competition! However, that’s not all guys! GlowPong will even throw in their patented glow balls, and they are willing to give you four of these with the purchase of the set, and they also are giving you their patented glow ball charging units. The company says when the cups and the balls are turned on the lighting effect will last as long as twelve hours! I also forgot to mention they are going to throw in a couple of ball washing cups as extras too! These things are out of this world! Are you guys drunk yet? I hope not, because we have more awesome beer pong gifts to review! This next one is called the Zaap Tournament and it is an eight foot beer pong table that is great for tailgating, camping, or in house play. When folded this bad boy has 23.5 by 23.5 dimensions and can be folded into four different sections for convenient storage. The table frame is made of aluminum and the table is made out of something called Melamine coating. This product is priced at a cool seventy dollars which is not too bad for the wallet, but there are only two reviews about it on Amazon, so I am going to say this doesn’t appeal to many people; however, it still looks like a pretty fun gift for seventy dollars no doubt…. and not nearly as much fun as a PongCaddie for a few bucks more. Kinda basic and boring by comparison! And here we are. The final frontier and where I make all my top choice decisions. Honestly, this decision was one of the easier ones I have had to make in the past, and not because of pricing either. I made my decision today based on meeting a practical need that has needed to be addressed since fraternities were just a thought. Oh yes, I am going with the PongCaddie everybody! The PongCaddie is a sweet gift for anyone of legal age, and the price is RIGHT, and it’s sanitary! Definitely an amazing product with not a single negative review about it. I think the guys over at PongCaddie are building these things with some quality care and expertise if you ask me! I mean come on everyone, this seems like the ULTIMATE beer pong table. It comes with everything you could ever possible want in a beer pong table! Why are you guys still reading this? Get out there and go get one, and then call me up for a friendly competitive game of BEER PONG!